The Panama Papers leak has come as a great shock for the fans of Amitabh Bachchan. Son of a legendary poet and a megastar himself for over four decades, Amitabh Bachchan has little to hide. His life has been like an open book. Everything about his life has been in the public domain: be it his affair with actress Rekha or his fallout with childhood friend and former Prime Minister of India, Late Rajiv Gandhi. Despite his iconic status, Bachchan's life has seen many lows but he has always found his way out of the depths, like a true fighter. But, there has been something very strange about Amitabh Bachchan's life: his perpetually shifting political allegiance. Ever since his fallout with Rajiv Gandhi, Bachchan has always described himself as an apolitical person. During the course of this article, we will try to examine the veracity of Bachchan's claim. 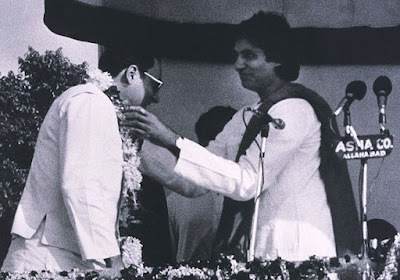 After the assassination of Indira Gandhi, the prodigal son Rajiv plunged into politics and invited his friend Amitabh to contest from Allahabad. Amitabh ended up defeating the veteran politician Hemvati Nandan Bahuguna but soon things turned sour between Rajiv and Amitabh, as a result of the Bofors scam, and the latter distanced himself from active politics. Amitabh Bachchan was never again to contest in an election. But does not contesting election alone make one apolitical? If we analyze Amitabh Bachchan's life, we can easily figure out that even though he contested in an election only once, back in 1984, he has, at different points in time, maintained political ties with different parities/leaders. His political allegiance has shifted purely on the basis of convenience. 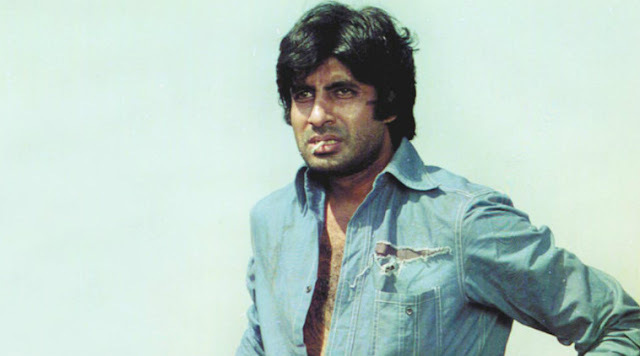 Like an actor playing different characters in different films, Bachchan has enjoyed different political flavors ever since the onset of his acting career. His closeness to Samjwadi Party leader Amar Singh has been well documented. In the late 90s, Amitabh Bachchan found himself on the brink of bankruptcy. He had established Amitabh Bachchan Corporation Ltd. (ABCL), India's first entertainment company, with his wife Jaya but some ill fated decisions ensured that ABCL’s net worth got nearly wiped by 1999. According to rumours, Bachchans were bailed out by Amar Singh who used to be Samajwadi Party Mulayam Singh Yadav's right hand man in those days. It may or may not be true but there is no denying that Amitabh Bachchan's association with Amar Singh helped Jaya Bachchan secure a Rajya Sabha seat. The Rajya Sabha forum has often been used by Jaya to defend her family. During the 2004 UP assembly elections while Jaya Bachchan openly campaigned for Samajwadi Party, Amitabh actively participated in blood donation camps and various other events organized by Samajwadi Party. Amitabh also appeared in various commercials for the UP government when Mulayam Singh Yadav became the Chief Minister. 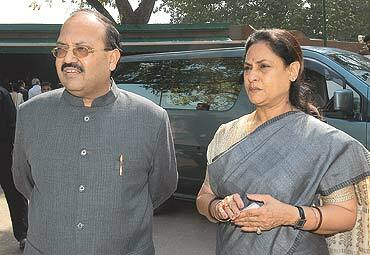 When Amar Singh fell out of Mulayam Singh's favor, Jaya Bachchan refused to vacate her Rajya Sabha seat. Following Amar Singh's ouster from Samajwadi Party, Amitabh Bachchan appeared to be getting closer to the then Gujarat Chief Minister, Narendra Modi. Perhaps, Bachchan was once trying to make up for his lost political footing. The ABCL fiasco must have taught him the importance of political clout to thrive in a country like India. He was certainly in no mood to repeat his earlier mistake when he had severed all political ties with the Congress owing to the Bofors scam. Congress leader Rajeev Shukla castigated Bachchan for opting to be the brand ambassador of Gujarat Tourism, "First it was in Uttar Pradesh when he was Mulayam Singh Yadav’s friend, when he did those ads for the SP’s election campaign and now it is Narendra Modi and Gujarat. It is a complete U turn, an ideological somersault." Since then Bachchan has only grown closer to Narendra Modi who is now the Prime Minister of India. Today, Bachchan is the face of many of Government of India's campaigns such Incredible India. It is not that Bachchan remained completely apolitical during the late 80s and mid 90s, for during the period he remained good friends with Shiv Sena supremo Bal Thackeray. 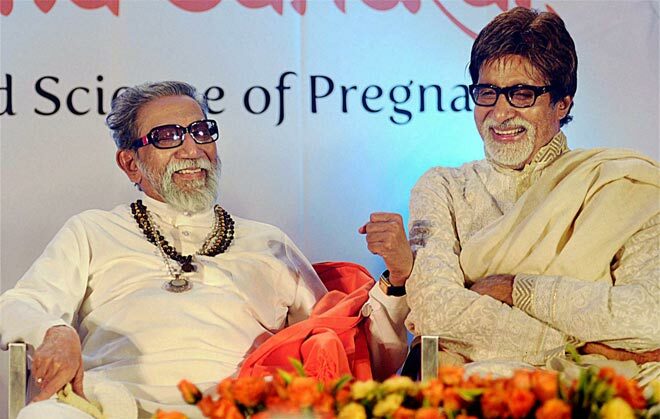 The friendship went on to save the day for Bachchan on many an occasion. Even today with Thackeray dead, Shiv Sena continues to back Bachchan every time he finds himself in the midst of a controversy, the most recent being the Maggi episode. It certainly pays to have powerful friends! Speaking of Bachchan family's political allegiance, it goes back to the days when an unmarried Indira had made friends with Teji, Bachchan's Sikh mother, at an event organized by Sarojini Naidu. Interestingly, it was Indira's father Jawaharlal Nehru, India's first Prime Minister, who brought Bachchan's poet father Harivansh Rai to Delhi and posted him as an Officer on Special Duty in the Ministry of External Affairs in 1955. When Rajiv married an Italian named Sonia Maino, Indira asked her to stay with Teji in order to learn the Indian ways. Also, if we were to believe veteran journalist Pankaj Vohra then even Amitabh Bachchan's entry into cinema owed a lot to the friendship between Indira and Teji. According to Vohra, Bachchan carried letters from the then Prime Minister Indira Gandhi addressed to Nargis Dutt and Khawaja Ahmed Abbas enjoining them to give him a break in films. 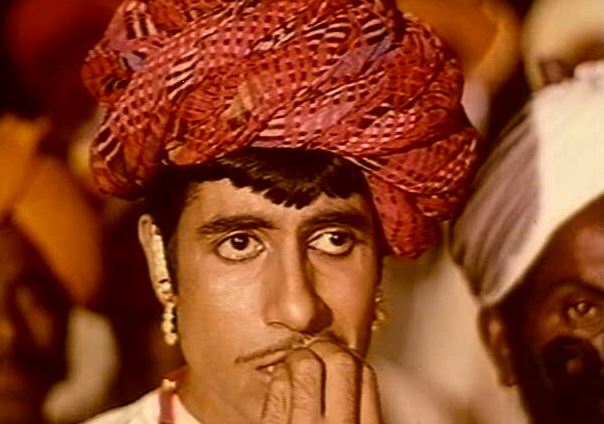 Bachchan was subsequently cast in Abbas' Saat Hindustani and Sunil Dutt's Reshma Aur Shera. The two films set the ball rolling for Bachchan's acting career. Also, it is a well known fact that Harivansh was among a few members of the intelligentsia who supported the Emergency. And, in the general elections that followed the Emergency, Amitabh wholeheartedly campaigned for Sanjay Gandhi despite the widespread dislike for the Gandhis at the time. Later in 1984, Bachchan, son of a Sikh woman, contested from Allahabad on a Congress ticket at Rajiv Gandhi's behest completely overlooking the atrocities the Sikhs were subjected to during the 1984 riots, following the assassination of Indira Gandhi by her Sikh bodyguards. Although, the Bachchans later distanced themselves from the Gandhis, they nonetheless reaped a lot out of the friendship with the powerful Gandhi family. For a man who claims to be apolitical, Amitabh Bachchan has spent a lot of time building up ties with powerful politicians. But more than his political ties themselves, it is his ever-shifting allegiance that is a subject of curiosity. It certainly pays to stay close to power circles for a famous personality like Bachchan. As for the politicians, it doesn't hurt to keep a popular face like Bachchan around. bloody hypocrite, this family is. Anyway, very insightful article.